Welcome on the website of english and irish red-white setter kennel, we hope that you will enjoy it. The best way to browse this web side is use one of this two web browser - Google Opera, or Mozilla Firefox. LIND LINNEUSZ Elater Polonica – CWC, CACIB, BEST MALE, WINNER OF POLAND, BOB ,QUALIFICATIONS FOR CRAFT'S 2016 ! SHERLOCK HOLMES Elater Polonica at his dog show debut scored the title of - BEST PUPPY IN BREED ! SERGIO RAMOS ( orange) and SEVERUS SNAPE ( blue), both of boys feel fine and grow up day by day! LEONARDO DA VINCI Elater Polonica – CAC, CACIB, BOB ! LIND LINNEUSZ Elater Polonica – CAC, BOB, I BOG !! –thanks of this achievement he repeated his debut from last year! We spent long June weekend in Nitra, where we was showing LIND at 3 Dog Shows! Our LIND did his best, and after 3 days he got title Grand Champion of Slovakia! LIND LINNEUSZ Elater Polonica – CAC, BOB, III BOG !! LIND LINNEUSZ Elater Polonica – CAC, CACIB, BOB ! LIND LINNEUSZ Elater Polonica – CAC, CACIB, BOS, Classification to CRUFTS 2016 ! LIND LINNEUSZ Elater Polonica – CWC, Club Winner, BOB !! LLEYTON of Meadow`s Brook ( 11 years old ! ) - – utility class – CWC, BOB, III BOG !! We are really pround of out Lleyton! LIND LINNEUSZ Elater Polonica – CAC, CACIB, BOB – He finished Champion of Slovakia ! LIND LINNEUSZ Elater Polonica – CAC, CACIB, SLOVAKIA CUP WINNER, BOB – He have been finished requirements of INTERNATIONAL CHAMPION C.I.E. !! At las week we took our Lleyton, the veteran setter to European Dog Show in BRNO. our Laura took great succes! She took title of Germany Winner, and finished Chamion of Germany. LAURA LIWIA Elater Polonica – Anw. VDH - Ch, CAC, CACIB, BOS, GERMAN WINNER ! LAURA LIWIA już oficjalnie – INTERCHAMPION C.I.E. Great Succes of LIND LINNEUSZ at his Secand Polish Dog Show ! LIND LINNEUSZ Elater Polonica – CWC, BOB , I BOG, I BIS !!! Very succesfull debiut of Lind Linneusz on the polish rings. At first, he took BOB, and later BOG! It was great present for 3rd birthday! LIND LINNEUSZ Elater Polonica – CWC, BOB , I BOG ! LEONARDO DA VINCI Elater Polonica – CWC, CACIB, BOB ! LAURA LIWIA Elater Polonica – CAC, CLUB WINNER ! - shiniched Champion of Slovakia ! Another successful start of our dogs! Last weekend we spend in beautiful, sunny and warm Nitra among our friends nice atmosphere. We are pleased to information, that in Mr Joe Gregory's house at 21.03.2014 were born lovely pups! Father of them is dog from our Kennel - Lucky Luke Elater Polonica FCI, mother is ANDALUCIA Heremon (Scylla). In litter are 4 girls, and 2 boys. Laura Liwia Elater Polonica FCI: 1, excellent, Champion's Show Winner, CWC, BEST OF BREED, one of 3 winners BEST OF GROUP VII, Finalist of CHAMPION'S SHOW Leszno 2014! 23.01.2014Today is 3th birthday of our lovelly Yesterday's Hero Desiree (Ishtar) :) We wish Her all best :) ! 04.12.2013 – we visited dr Jana Siembieda's clinic to checked Laura Liwia Elater Polonica FCI hip-joints we reporting, that Laura’s HD is Normal (rangk A) ! LAURA LIWIA Elater Polonica – dosk.I , CWC, CACIB. POLAND WINNER, CRUFT’S NOMINATION 2014 ! LEONARDO DA VINCI Elater Polonica – dosk I, Anw. VDH-CH, CAC, CACIB, BOB ! we reporting, that Yesterday's HD is Normal (rangk A) ! We are proud of our dogs! At the end of Year (2013) we planning to have litter of English Setter too. Dog show ran at sympathetic and picnic atmosphere. Our little Laura again showed what did she could. At the start she won class, and finally became the best female in rase. LAURA LIWIA Elater Polonica– Anw. VDH-CH, CAC - she started two Champions of Germany! LAURA LIWIA Elater Polonica– CWC, res. CACIB - she completed required to Champion of Poland. 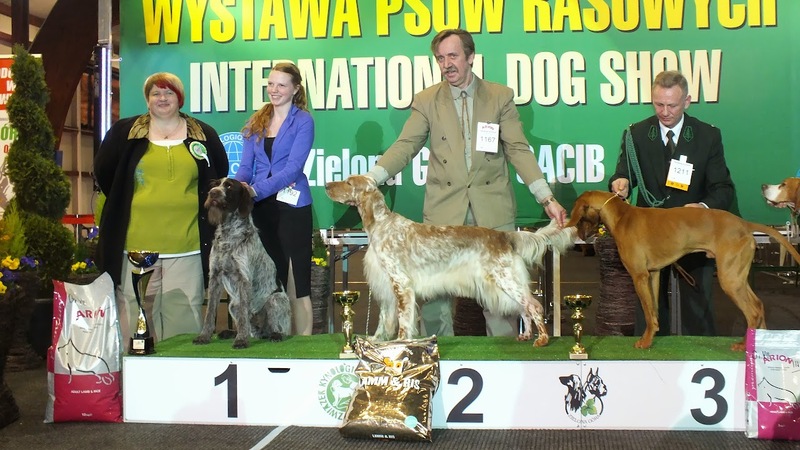 Yesteday`s Hero DESIREE- CWC, CACIB, BOB she completed required to Champion of Poland. New dog show, and new success of Elater Kennel! LEONARDO DA VINCI Elater Polonica – CAC, CACIB, BOB, III BOG ! It was really good weekend ! Very successfully Slovakia . LAURA LIWIA Elater Polonica – CAC, CACIB, BOB, II BOG ! NATURAL BEAUTY Elater Polonica – CWC, ZW, CACIB , BOB !! – she finally fulfilled requirements for title of INTER CHAMPION. – C.I.E !! She is 6th Interchampion from our kennel ! We are really proud of BEAUTY!! !